It’s 50th anniversary time for the album previously known as Cheap Thrills. But this version, like the singer it features, is different than most. Janis Joplin first came to stardom with a fabled performance at June 1967’s Monterey Pop Festival at which point, Big Brother & the Holding Company — the band she fronted — had only delivered a weak debut on the tiny Mainstream label. Clive Davis from Columbia signed them after that explosive gig and off they went to work on their first major label statement. 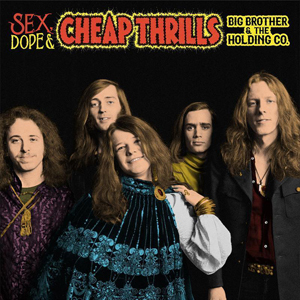 The sessions for that sophomore disc, initially titled Cheap Thrills (shortened from the name of this collection over the objections of the band), were notoriously difficult as the five members, in particular lead singer Joplin, did not connect with producer John Simon. Check out film footage from 1974’s documentary Janis for how difficult and tense that relationship was. JANIS® and JANIS JOPLIN® are registered trademarks of Fantality corp.
©2017 Fantality Corp. All rights reserved.